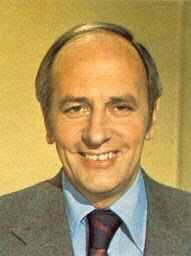 Although Moore may be synonymous with ITV’s football coverage, he was employed by the BBC as a radio commentator before he moved into television. During the 1966 World Cup final he was one of the radio commentators, being behind the microphone for Geoff Hurst’s controversial ‘did it cross the line?’ goal. Two years later he moved to ITV, helping front London Weekend Television’s football coverage on The Big Match as well as commentating for it. The first major tournament for Moore with ITV was the 1970 World Cup in Mexico. But he would be staying in London, hosting the coverage rather than commentating. If he felt any disappointment at not doing commentary then it would be softened by the rave reviews the station received for its revolutionary panel. Jimmy Hill took much of the credit for the concept, but Moore fully played his part as Malcolm Allison, Pat Crerand, Derek Dougan and Bob McNab debated matters in entertaining fashion with ITV unusually winning the ratings war against the BBC. For Moore, it set the trend. When World Cups came along he would stay at home, posing the questions to resident motormouths such as Brian Clough while Hugh Johns and then Martin Tyler voiced the biggest games instead of him. And the pattern would spread into other football coverage, particularly for midweek matches. When England played Poland in their never-to-be-forgotten qualifier at Wembley in October 1973, Moore was presenting the programme live on-site as the nation watched Sir Alf Ramsey’s side agonisingly fall short. Clough was one of the pundits and Moore eventually ran out of patience with him continually labelling Poland’s Jan Tomaszewski a “clown”, pointing his pen towards him as he reminded the outspoken panelist how the goalkeeper had made several vital saves to keep his side in the game. Clough didn’t agree, but the two Brians made for a good pairing. They may have seemed quite different as people but they worked well together and, by all accounts, enjoyed each other’s company. Brian Moore takes Brian Clough to task over calling Poland goalkeeper Jan Tomaszewski a “clown”. For Moore, England commentaries were a treat as his presenting duties quite often denied him the opportunity to perform the role. He did though usually get to describe the annual jousts with Scotland (shown in World of Sport hosted by Dickie Davies) among other matches each year. It was puzzling though that if Moore could be freed from presenting to go and commentate on the 1980 European Championship in Italy, why couldn’t he do so for at least part of the 1982 World Cup? And if he was allowed to fly out to Mexico to commentate on the 1986 World Cup final, then why wasn’t he able to do so a week earlier for England’s huge match against Argentina? When Moore did get to commentate on England, he would occasionally get a match to remember. One that would stand out was the great 2-0 win away to Brazil in June 1984, but it would be tinged with disappointment. ITV would only start showing the match at half-time, meaning the incredible goal John Barnes scored in the dying seconds of the first-half was not seen live. But Moore’s commentary of the goal for brief highlights shown at half-time has become well known. “John Barnes now… He might go all the way for England… Barnes… He’s scored and England, amazingly, are into the lead.” How cruel it wasn’t seen as it happened. Foreign ventures could at times prove fraught. In 1985 Moore was in Mexico to see England play Italy as part of preparations for the World Cup a year later. But as his commentary began he sounded like a man commentating from deep inside a cave, eventually being cut off for 20 minutes as Martin Tyler filled in from London while attempts were made to solve the problems. Moore was then left to commentate down a telephone from the back of the commentary box. Sometimes a commentator’s life isn’t as glamorous as it’s cracked up to be! 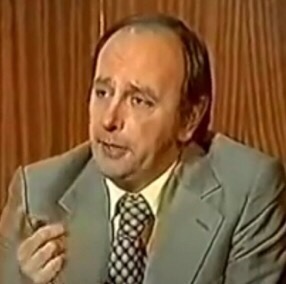 Moore was relieved of his presenting duties with Midweek Sports Special in the summer of 1986 and he was now free to focus on commentating (a reduction in his workload which he believed may have helped save his live after he was diagnosed with heart trouble). For the next two years he regularly described England matches – ITV tended to alternate games with the BBC – including the 4-1 win away to Yugoslavia that took them through to Euro ’88. While there, England flopped and Moore was commentating live for their opening defeat by the Republic of Ireland. Two years later, the only England match ITV exclusively showed live at Italia ’90 was a poor 1-1 draw against the Irish with Moore commentating. But he would also commentate live on England’s three nerve-jangling knockout matches, hailing the “fantastic finale” as David Platt volleyed in a dramatic late winner against Belgium before telling us that “England sad, sad, sadly are out” after Chris Waddle’s penalty was missed against West Germany. In between he would try to talk Ron Atkinson out of trouble when his regular co-commentator made a remark that some might have considered racist during England’s win over Cameroon. Although Moore’s work had gone unappreciated by many due to England’s knockout matches also being live on the BBC, he could feel pride that he had finally commentated on them for ITV at a World Cup – and it had been their most epic adventure since 1966. In October 1993 England visited the Netherlands for a vital World Cup qualifier. With Norway out in front, one of the two traditional heavyweights in the group would fail to make the finals as runners-up. ITV had secured the rights to the match, arguably the biggest England had played since the Italia ’90 semi-final. For ITV it was a rare opportunity to show England outside of a major tournament, the BBC having secured the exclusive terrestrial rights to the FA Cup and most England matches in 1988. Moore and Ron Atkinson described the gripping and controversial contest, being adamant Ronald Koeman should have been red carded when the Dutchman hauled back David Platt. A few minutes later the Dutch were awarded a free-kick at the opposite end, to be taken by Koeman. “What an irony it would be if he scored with this when he should have been off the field,” said Moore. If that seemed perceptive given what was to follow, then his line as Koeman strode up for a retake (after his initial effort was charged down) has gone into legend. Moore next commentated on England during Euro ’96, covering all their five matches including two ITV showed exclusively live. The following year ITV took over the contract for terrestrial coverage of England and the FA Cup, with Moore commentating for delayed coverage on England’s famous 0-0 draw with Italy that took them through to the 1998 World Cup. The tournament would mark the end for Moore after three decades with ITV as he prepared to hang up his microphone. Although the 1998 World Cup final would be his last match, perhaps his true finale would be the momentous second round match between Argentina and England. Unlike the final this was exclusively live on ITV and it attracted a huge audience, with the watching millions experiencing a night of high emotion. He provided fitting words for Michael Owen’s brilliant goal (“it’s a great run by Michael Owen and he might finish it off… It’s a wonderful goal”) and summed up the agony over David Beckham’s sending off with a simple “oh no”. Unfortunately Moore’s last act commentating on England would see him come in for some criticism. David Batty stepped forward to take England’s fifth kick in the shoot-out, needing to score to force sudden death with Moore sounding anxious about the fact Batty had never netted for his country. Connecting that his co-commentator Kevin Keegan had managed Batty at Newcastle United, he decided to put him on the spot just seconds before the penalty was taken as he sought reassurance. “Now you know him better than anyone, probably. Do you back him to score? Quickly, yes or no?” Keegan said yes, but he’d been backed into a corner where it was the only answer he could really give (imagine the slagging off he’d have got if he had said no and Batty then scored). Almost instantly Batty saw his effort saved as Moore described England’s third shoot-out exit from a major tournament in the 1990s. Moore’s England years were over, but it was an enthralling match to end with. Sadly, Moore would not get long to enjoy his semi-retirement (he continued to perform some broadcasting duties but was no longer commentating). He died on September 1, 2001, the day when England memorably beat Germany 5-1. Tributes poured in for Moore and many would reflect on how much he would have enjoyed the match. One could certainly imagine him giving it the trademark “and it’s in there” as Michael Owen equalised; saying “and England go into the lead and what a way to do it” when Steven Gerrard drove in the second goal; and proclaiming it as “a truly wonderful night for England fans everywhere” as the goals continued in the second half. While with ITV, Moore endured 30 years of hurt so far as covering England was concerned as they failed to win a major trophy or even reach a final. But there had been plenty of memorable moments along the way, getting to commentate on two epic semi-finals. His successor Clive Tyldesley has never even got to do that. Moore was a friend of the people and is sadly missed by many.